I’ve never read anything else by Rainbow Rowell, but a lot of the Goodreads reviews talk about her style being really easy – and it is. I started reading this late one afternoon and I’d read the first 100 pages before I realised what had happened. The story is well-paced; officially it takes less than a week, although there are serious flashbacks that kinda make that a lie. The prose flows – lots of familiar-sounding dialogue, enough detail to sketch in believable places and people. I’m not great at explaining how prose works. All I know is that this was delightful to read, and partly that was the words themselves. The premise: Georgie has the chance at a dream job – but she’ll have to work over Christmas. Husband and kids go off on their family holiday without her. Georgie discovers that the old landline at her mum’s house somehow allows her talk to her husband – but him from the past. The novel is then filled with the minutiae of daily life: work and memories and family relationships and that worrying and gnawing at problems that gets so familiar when you’re old and have lots of worrying to do. The best thing about this story is that it’s about a woman thinking about, and worrying about, her marriage. That sounds very self-indulgent and maybe a bit dull or stupid, but bear with me. It’s refreshing to read about a woman confronting problems like this and not taking all the blame, not taking a convenient way out, and not having things magically solved. (Maybe there are lots of books like this – in fact I’m sure there are – but they’re not on my radar.) Yes, there were a few points where I got a little uncomfortable about what might almost be being suggested about her (‘letting herself go’, etc), but for me at least they never quite got to the really problematic point; they were redeemed by some thought or action that pulled it back, didn’t make her the villain for not having time to buy new bras, and so on. And I liked that the focus was on the bit after the happily-ever-after – the bit after marriage, and after kids, and things aren’t entirely wonderful but they’re also not entirely horrid, they’re just… life. But they can still be better, and yes life and marriage require work and that’s ok.
Georgie was pretty easy to identify with, and all the surrounding characters were too. At times I wondered if Rowell was trying too hard to be ‘inclusive’ – but then I realised that just maybe I was overthinking it, that actually there wasn’t a huge amount of diversity (although to be fair the cast isn’t that big), and that none of the ‘minority’ characters were such just to make a statement. (See how my brain gets me caught up in tangles?) Also, the pugs are hilarious. I was going to start this review by saying “this isn’t the sort of book I normally read.” Which is basically true, but why start with that line? And I started thinking about the answer to that question. And then I thought about starting this review with this self interrogation… and I realised that that was still front-and-centring the issue, rather than the novel. It’s one worth talking about but it’s entirely too self-indulgent to make it the first bit. So, here it is, at the end. This is not the sort of book I normally read. Because it is, first and foremost, a romance. And I don’t think of myself as someone who reads romance, even though actually I love ‘good’ romance in my novels and movies – by which I mean it’s realistic but/and sweet but not saccharine, and – most especially, in my head – not the focus of the story. So why was I so keen to defend myself? Because despite all the time I spend thinking about why reading SF isn’t a bad thing to do, I still automatically feel like I have to barricade myself away from that genre – the female one, the one that everyone else bashes when they’re not bashing romance – even though I am well, well aware – in my head – that oh my goodness there are so many things wrong in thinking/acting like that. And the other thing is that this is absolutely SF. If we’re happy to accept John Chu’s “The Water that Falls on you from Nowhere” as SF – and heck, we should be – then so is this. That short story is all about a romantic relationship and how it works out with the family; the SFnal element is water that, literally, falls on you from nowhere. It’s never explained. So this, a story that’s about a romantic relationship and family, where the main character has access to a phone that allows to talk to someone 15 years ago? This is absolutely SF. Was I more embarrassed because this was written by a woman, and therefore more clearly can be classified as a romance? Because it’s a novel rather than a short story from an obviously SF venue? Who knows. At any rate, I’m not embarrassed by having read it, because it’s one of the easiest – pleasant, fast, cosy – books I’ve read in ages. 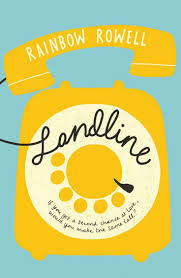 I just finished reading Landline too and loved it. As you say this is absolutely SF and absolutely a well written and engaging. I picked it up because it’s Book Riot’s first podcast book club book (July) and I wanted to read along and I’m so happy that I did. Great review!